Avid collector, Andrew Hawley, announces his search for original January 1969 Jimi Hendrix German Tour Gunther Kieser Vintage Concert Posters. Born in 1930, Kieser became one of the most famous rock and roll concert poster artists of his time. Kieser create probably the most iconic image of Hendrix—the "medusa" image. The larger poster was 32 x 48 inches. Avid collector, Andrew Hawley, announces his search for original January 1969 Jimi Hendrix German Tour Gunther Kieser vintage concert posters. Born in 1930, Kieser became one of the most famous rock and roll concert poster artists of his time. According to Hawley, “Kieser designed nine posters for Hendrix's 1969 German tour. The tour started in Hamburg and ended in Berlin. Kieser create probably the most iconic image of Hendrix—the "medusa" image. The larger poster was 32 x 48 inches. They were hung in bus shelters and street walls. A smaller 22 x 33 inch poster was also printed. The smaller posters were hung in store and local establishments. All these posters were wheat pasted onto walls. A merchandise poster was produced and sold at the concerts. This poster has 15 1 69 Stuttgart printed on it. The concert posters used for advertising will mention a date on the bottom line of the poster and has white lettering on top. 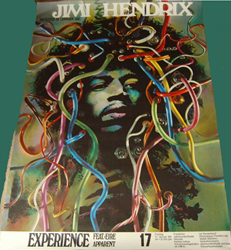 Kieser also designed posters for the Who, the Doors and the Grateful Dead.” For examples of other psychedelic Jimi Hendrix posters go to: [http://www.vintageconcertposterbuyer.com/psychedelic/jimi_hendrix.html. If you have an original January 1969 Jimi Hendrix German Tour Gunther Kieser concert poster, Hawley is willing to pay $5,000 cash for each concert poster. He is also interested in any authentic Kieser Doors, Grateful Dead and Janis Joplin concert posters. Please call 310-346-1965 or email andrew (at) vintageconcertposterbuyer.com.